Print your logo onto these custom printed desk planner pads a2 - 25 sheets or one of our other innovative calendars and use them in your next marketing campaign as a unique giveaway item. These custom branded desk planner calendars come with 25 leaves of high-quality 70gsm paper and a cardboard back. The four colour printing process gives the option of unlimited spot colours or stunning full colour at no extra cost but PMS colour matches are only approximate. The artwork can bleed off on all four sides and a sketching grid can easily be added if needed. Branding Options: Offset Print: W 594mm x H 420mm. Custom brand these a3 desk mat calendars or one of our best-selling promotional office accessories»calendars with your company logo! Personalise your desk planner pads a2 - 25 sheets or custom design calendars for your marketing campaign. How can these unique promotional desk planner pads a2 - 25 sheets or our personalised calendars fit in with your marketing strategy and help you maximise your brand exposure? 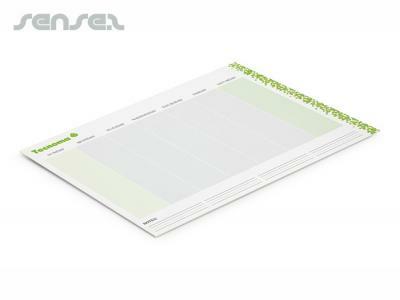 Our custom made Desk Planner Pads A2 - 25 Sheets can be produced from a minimum quantity of 100 pieces. We can have your logo branded on these corporate Desk Planner Pads A2 - 25 Sheets in Full Colour Digital Print. A setup fee of AU$180.00 will apply to make the film.